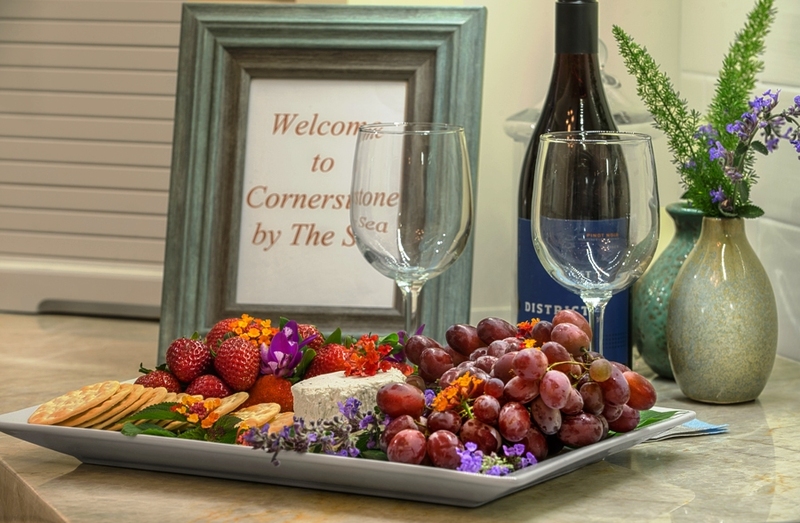 Welcome to “Cornerstone!” Home sleeps up to 6 adults and 2 children age 12 and under. 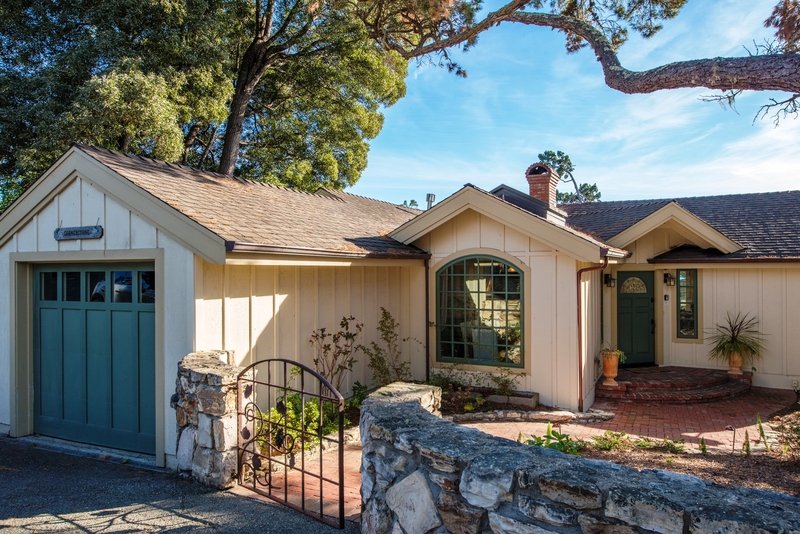 Gracious living indoors and out is the hallmark of this Carmel home, with spacious flower-filled patios surrounded by old stone walls offering privacy as well as a sense of history, and recently remodeled interiors that put a fresh face on cottage style. 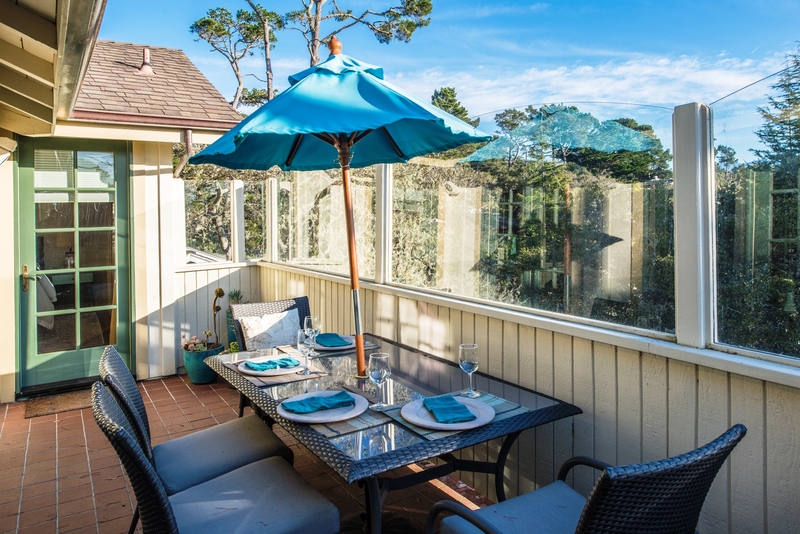 Located in a quiet neighborhood within walking distance of Carmel-by-the-Sea’s shopping and restaurant district, the 3 bedroom, 2.5 bath pet-friendly house features treetop and distant ocean views from the living room and first-floor balcony, whitewashed open-beam ceilings, and windows throughout that look out onto beautiful outdoor living spaces. 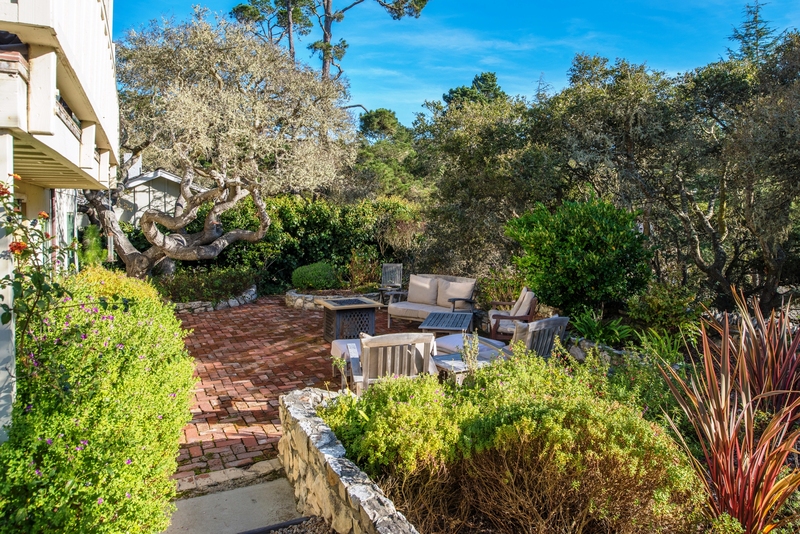 Just a few minutes by car to golfing and fine dining in Pebble Beach, the 1,650-square-foot home is also 10 minutes away from downtown Monterey and Cannery Row, 20 minutes to the wineries and shops of Carmel Valley, and about half an hour from the stunning sights of Big Sur. 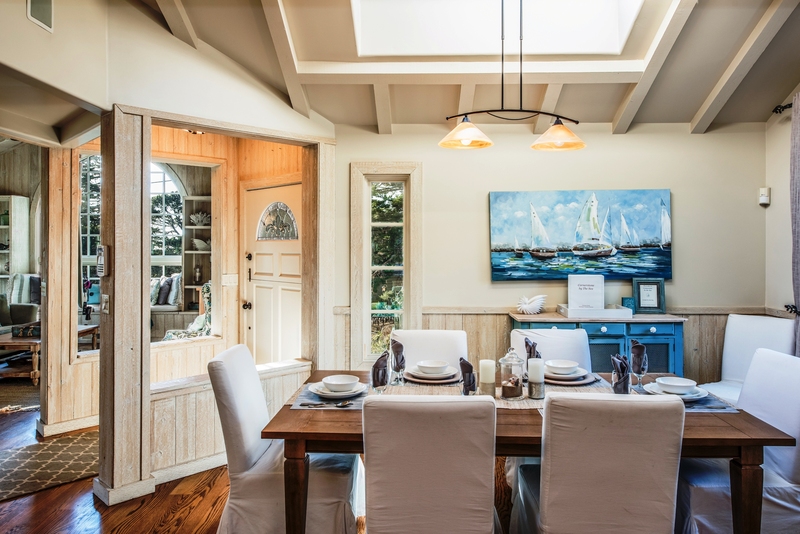 An open floor plan greets guests as soon as they step through the front door, making entertaining a breeze on the upper level. 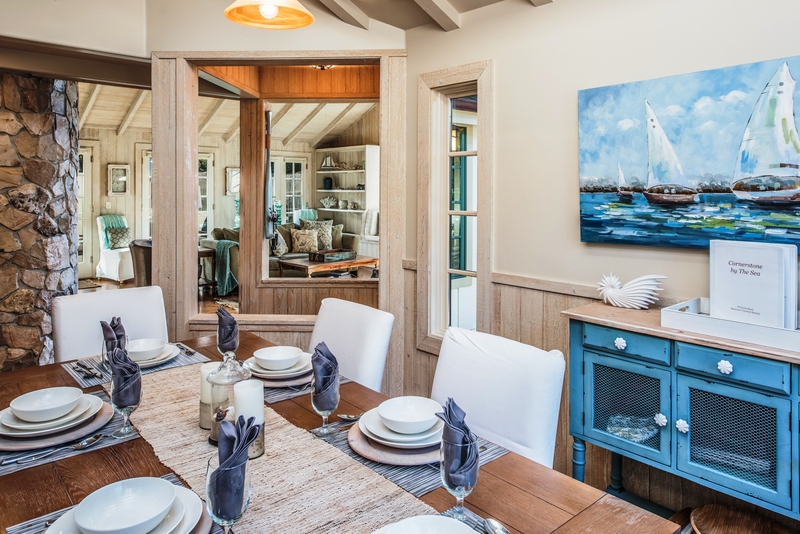 Hardwood floors grace the living room, gourmet kitchen and dining room, and cottage beach décor soothes the senses in shades of off-white, sand, blue and gray. A large arched window in the living room helps bring the outdoors inside, with lovely views of cypress and Monterey pine trees all around, and French doors lead out onto an adjacent balcony. 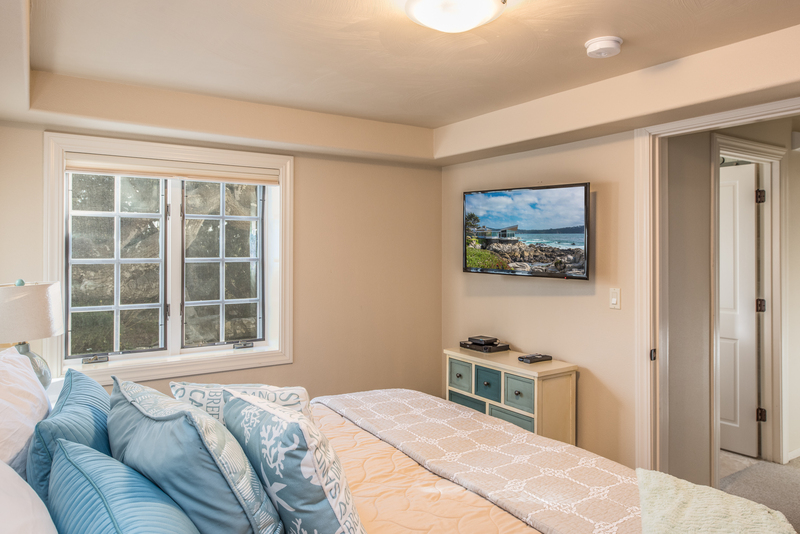 The living room includes a queen sofa bed to sleep 1 - 2 children, a gas fireplace and 46-inch HDTV and Blu-Ray player, as well as ample room for playing board games or conversation. There is also a convenient half-bath on this level. 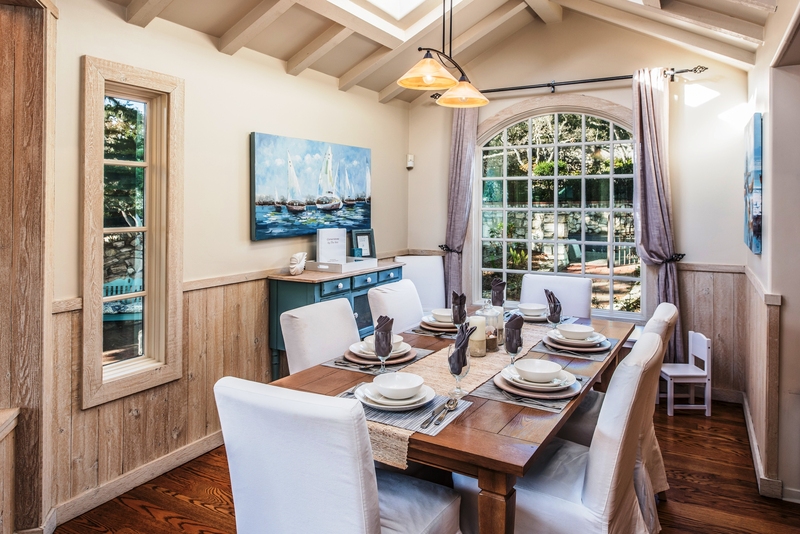 The dining room table can seat 6, and there is an adjacent smaller children’s table. 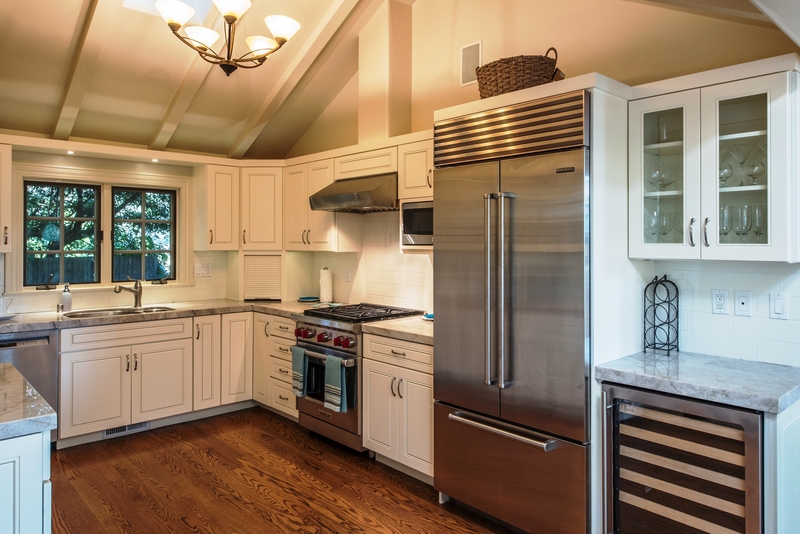 In the kitchen the Sub-Zero refrigerator, a Wolf stove, and wine refrigerator are set off by marble counter tops and antique white cabinetry, all of which are sure to delight the most discriminating of chefs. 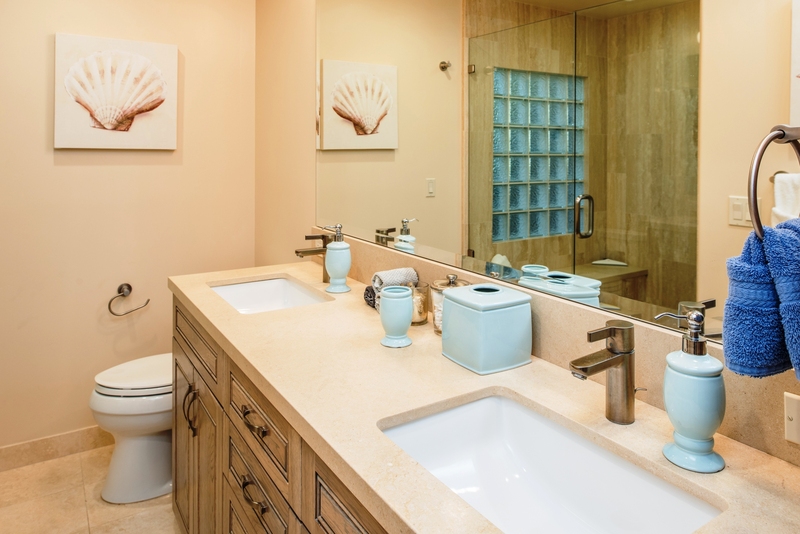 A short hallway leads to the master bedroom suite, where the bathroom includes a custom glass couple’s shower with two sunburst shower heads, one a removable handheld model, as well as a custom built-in bench. Floor and walls are finished in limestone tile, and dual sinks with limestone counter top, brushed nickel fixtures, and dark wood cabinets add to the ambiance. The master bedroom features a king bed from which you can see patio views through a unique scalloped window. 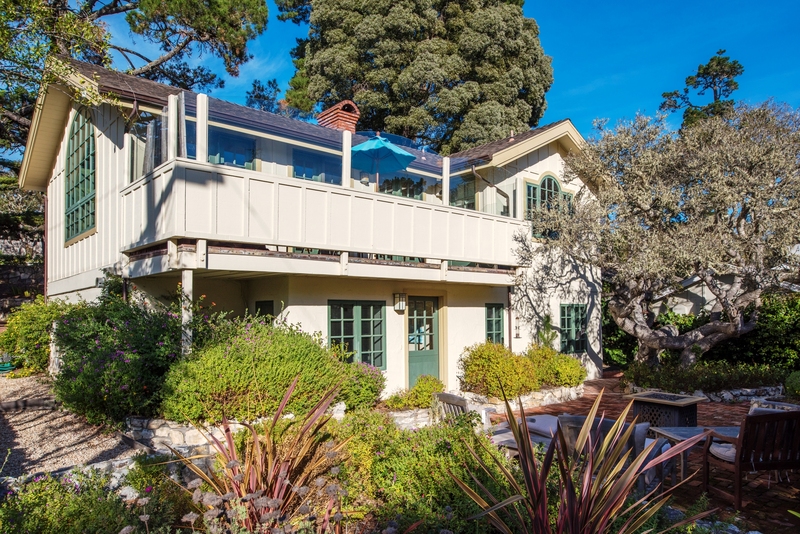 Open-beamed ceilings and French doors leading to the upper level balcony can be found here as well. A stairway leads to two more bedrooms on the lower level, both with walk-in closets. 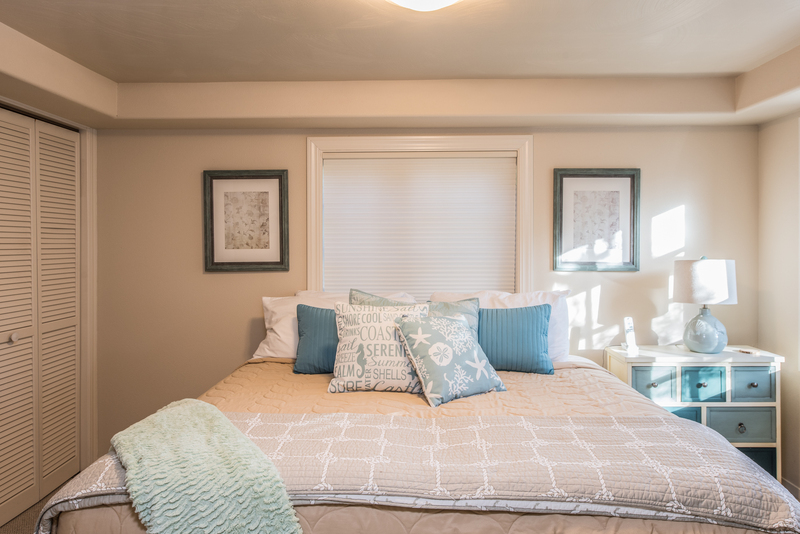 The first bedroom has two twin beds that can be converted to a king with memory foam topper, while the other bedroom includes both a queen bed and a day bed that can sleep 1 child. Both bedrooms have views of the outside patio. 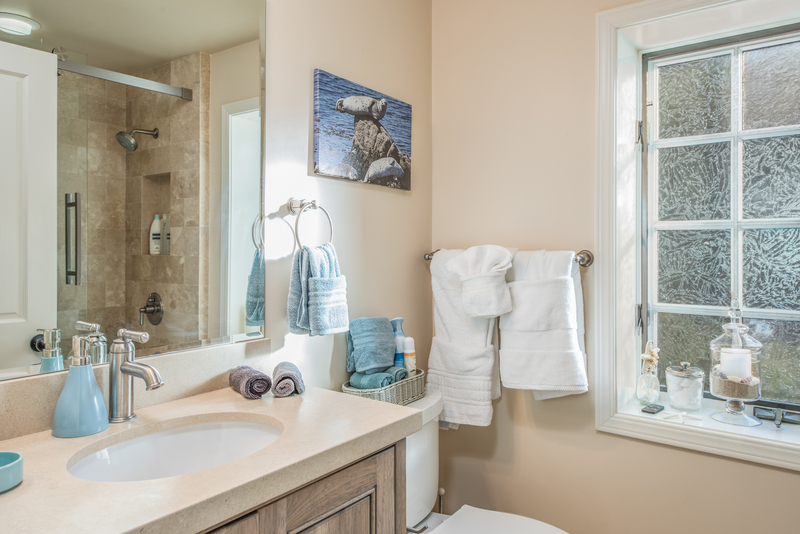 The shared bathroom has a tub-shower combo, with brushed nickel fixtures, whitewashed hickory cabinets, limestone tile floors and limestone counter top. Multi-level outdoor patios include tables, chairs and a gas grill for outdoor barbecues. Also available is a generously sized one-car garage, which can accommodate a large van or SUV, and has ample storage space for beach gear. 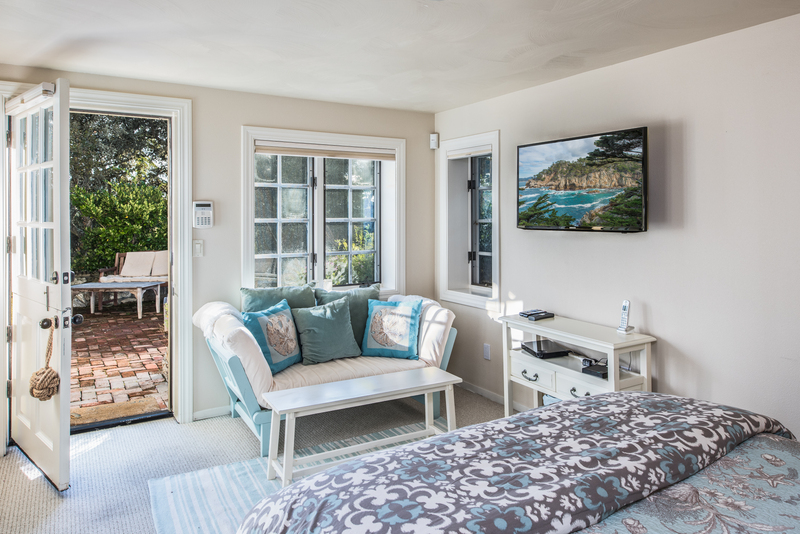 Guests stayed in june 2018 ~ Reviewed on Homeaway ~ 5 out of 5 Stars! "Very clean, well appointed almost like new home! Close-in house to all Carmel has to offer. The property manager is someone I would hire in a minute...Pravenesh provided outstanding, ongoing service on every issue, from WiFi help to coffee maker replacement to package delivery from his office!" 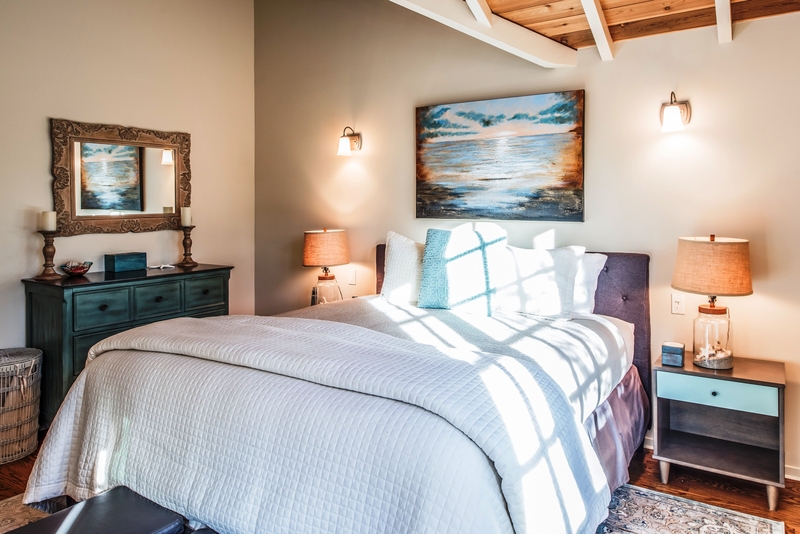 Guests stayed in March 2018 ~ Reviewed on Homeaway ~ 5 out of 5 Stars! Note: This bedroom has a private en suite bathroom with over-sized standing shower. 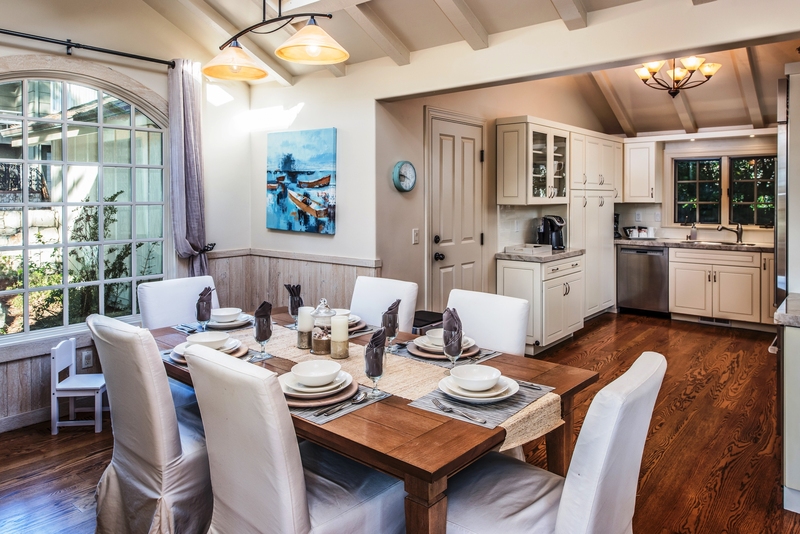 The master bedroom is on the same level as the living room, dining room and kitchen. Note: This room has a TV. Note: Bedrooms 2 and 3 share a hall bath on this level that has a shower over tub.